Extron Electronics has launched the SMP 351 Streaming Media Processor with FlexOS, an H.264 streaming media processor that captures and distributes live AV sources and presentations. With five available inputs, the SMP 351 creates high-impact content by combining two high resolution signals, a background image, and metadata, into dynamic layouts that enhance a presentation's message. It supports both live streaming and recording capabilities, delivering presentations to anywhere a network can reach. With Extron's FlexOS embedded operating system, the SMP 351 adapts easily to new requirements. Extron FlexOS applications on the SMP 351 can be configured to interface with control ports and automate system operation. It is easy to use, and with no licensing fees, has a low cost of ownership. The SMP 351 is a flexible, cost-effective way to deliver presentations to a larger audience. Extron Electronics has launched the SMP 351 Streaming Media Processor with FlexOS. "The convergence of AV and IT creates new opportunities for AV systems, delivering presentations over IP networks with streaming and recording," said Casey Hall, vice president of sales and marketing for Extron. "With its comprehensive AV integration features and the FlexOS platform, the SMP 351 can be adapted to many system requirements. It delivers the flexibility, quality and performance that makes it a superior choice for streaming and recording." The SMP 351 offers extensive streaming capabilities. It can stream and record simultaneously and can stream concurrently at two different resolutions and bit rates using a range of transport protocols and session management options. The SMP 351 creates MP4 media files that are directly compatible with virtually any software media player and popular content management system. MP4 recorded media can be saved to the internal solid state drive, a USB thumb drive, or a network storage directory to meet different application requirements. Designed for use in professional AV systems, the SMP 351 can be controlled using serial RS-232, Ethernet, and four digital I/O ports. Extron FlexOS applications installed on the SMP 351 interface with control ports and automate system operation. 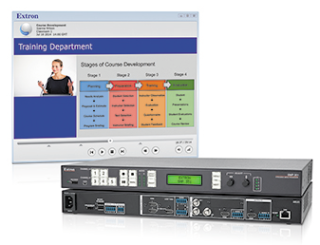 The SMP 351 is complemented by Extron Streaming Content Manager – SCM software. SCM is used to administrate users, groups, and recordings produced by the SMP 351. SCM also processes the recorded media into file packages that provide a data-rich playback experience using the Extron Media Player – EMP, a browser based media player that can be operated from virtually any computer or mobile device.